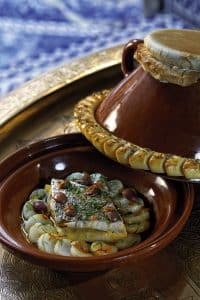 Today, Moroccan cuisine is recognised as one of the best cuisines in the world, as can be seen by the many rankings which give it its pride of place. It is renowned for its Mediterranean flavours, its sweet and savoury combinations, its spices, etc. And this cuisine is constantly being made even richer from other cultures without losing its own identity. 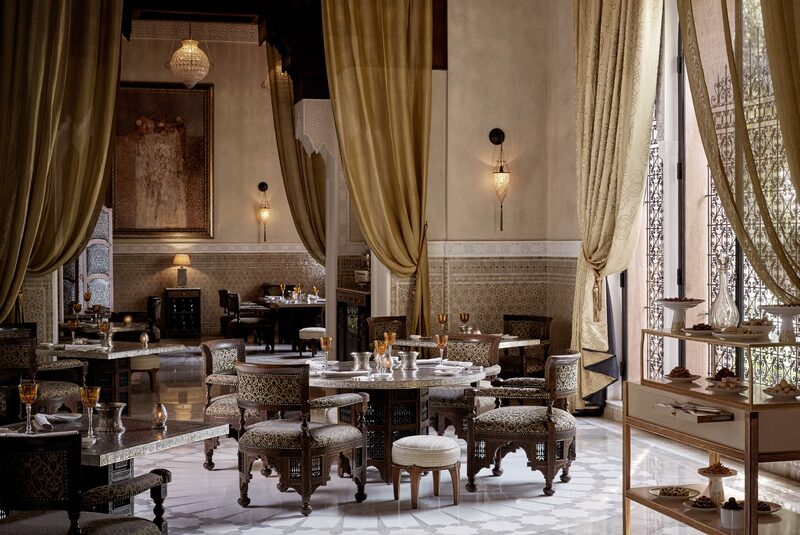 Come and discover chef Yannick Alléno’s take on Moroccan cuisine while enjoying the dishes offered in one of Royal Mansour Marrakech’s restaurants. Among the signature dishes of Moroccan cuisine, tangia takes the pride of place. It is a Marrakesh speciality which requires a lot of patience to taste it. But, once you take a bite, you can’t help but love the texture and flavours of the Moroccan tangia or “tanjia al Marrakchia”. The Moroccan tangia is known for the way it is prepared, which respects a ritual that has been established over many years. This dish is not cooked as a simple stew. It is cooked for a long time so that the meat is particularly tender and is full of flavour. Tangia is prepared in a terracotta amphora which has the same name as this dish. Traditionally, it is the men who are responsible for preparing this typical recipe from the city of Marrakesh. It is prepared the night before so that it can cook overnight. The pieces of meat are put in the tangia. The original recipe is prepared with veal. But nowadays there are variants with other meats like rabbit and lamb. In Tangier, you can even find a fish-based version. Once the pieces of meat are in the bottom of the amphora, all the spices are added (mainly saffron and cumin) as well as candied lemon. Then a little olive oil and Moroccan smen are added (a clear butter made from a mix of butter, salt and za’atar or dried oregano that is left to ferment). Only a little liquid is needed to cook tangia. You can add one or two small glasses of water. But the idea is that the meat roasts when it is cooking. Once all the ingredients have been added to the tangia, pierce some kind of brown paper with little holes to let the steam out when cooking and use it to cover the amphora again. The paper is kept in place with a wire frame. It is when it is cooking that the traditional appearance of this Moroccan dish really comes together. The tangia is put in the ashes, from the fire used to heat the bathhouse, for the whole night. How do you eat Moroccan tangia? Traditionally, tangia is a sociable dish that you share with relatives or friends. Originally, it was eaten without vegetables. It is generally served with legumes and/or grains. But over the last few years it has become more common to see tangia served with onions or potatoes.